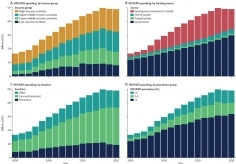 Financing Global Health 2017 is the ninth edition of IHME’s annual series on global health spending and health financing. In addition to describing the trends in development assistance for health (DAH) and domestic government, prepaid private, and out-of-pocket health spending, this year’s report features a deep dive into financing focused on HIV/AIDS. 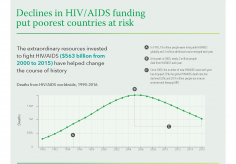 Dramatic increases in total spending on HIV/AIDS since 2000 have mitigated a major global health crisis. 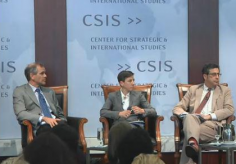 However, the vulnerability of low-income and high-burden countries to reductions in DAH is a critical issue. Tracking resources for HIV/AIDS and other specific diseases can illuminate the countries that are most vulnerable to future reductions in DAH and be used to gauge progress toward goals such as the Sustainable Development Goals (SDGs). 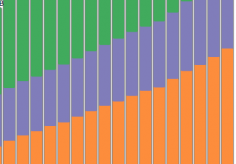 In tandem, these data illustrate that it is increasingly important to track health spending with enough precision and granularity to inform policy, evaluate effectiveness, and identify areas where more investment could lead to improved health. Such analysis is invaluable as we look toward attaining universal health coverage (UHC), another focal point of this year’s report. 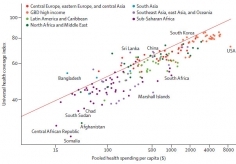 In addition to a focus on total health spending, DAH, and HIV/AIDS spending, this report also looks forward and estimates health care spending and potential gains in UHC service coverage through 2040. Our estimates show that improvements in the health care services delivery process could lead to UHC gains in many countries. 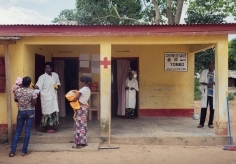 This analysis focuses on assessing how pooled resources for health can be catalyst for progress toward ensuring critical services are provided for all. The coverage of past trends and future health spending projections builds on data and analyses presented in two papers published this year: “Spending on health and HIV/AIDS: domestic health spending and development assistance in 188 countries, 1995–2015,” and “Trends in future health financing and coverage: future health spending and universal health coverage in 188 countries, 2016–2040.” Both analyses were published in The Lancet in April 2018 by the Global Burden of Disease Health Financing Collaborator Network. More information about these data and methods are found in the online methods annex. More information about joining the Global Burden of Disease Health Financing Collaborator Network can be found here. Institute for Health Metrics and Evaluation (IHME). Financing Global Health 2017: Funding Universal Health Coverage and the Unfinished HIV/AIDS Agenda. Seattle, WA: IHME, 2018. 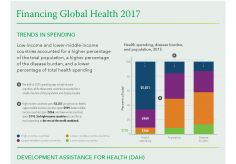 Highlights from the Financing Global Health 2017 report including trends in health spending, development assistance for health (DAH), HIV spending, and universal health coverage. 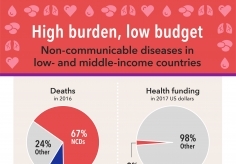 Non-communicable diseases account for 67% of all deaths yet only receive 2% of the funding to improve health in low- and middle-income countries.